Success in life is similar to a domino effect – only difference being that in a domino effect the time between two successive events is relatively small and in life it can be considerable – months, years even. The challenge is that while you work at attaining success, you can never be sure about what event will contribute to your success to what extent. There is simple solution to overcome this challenge. Give your best to whatever you do today and it will shape your future with some rewards in present also. Past affects present. So give your best to your present before it becomes your past. What you did at school may have some repercussions for you in corporate world. If we chose to move on a parallel path and do it right then it may shape the course of your future. People like Linus Torvalds (Linux) and Matt Mullenweg (WordPress) started working on open source projects that later became the core of their life or businesses that they have built. 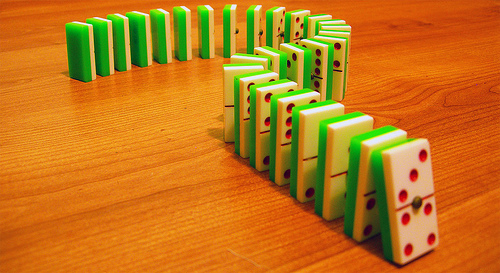 Are you working on creating a domino effect? Good deeds that you do today (with or without getting something in return) can help you in future. So keep on filling the bank of action. Want a new job; create a parallel path, develop an online platform and get a showcase ready, it will cause people to notice you and be willing to partner with you. Same goes for starting a new venture. Willing to launch a musical or speaking career – work at being good at your craft, find an audience, may be starting at local stage, increase your influence in that small sphere, be seen by the people who matter and move forward. The ideas shared in this paragraph are in condensed form – when you act in these ideas you may take years, but ultimately you will reach there. One more thing, at times the end result may be different than you planned for. You may have started to become as singer but end up as a song producer. This much flexibility is required if you want to make a mark in any area. Flexibility should not be taken as excuse for a weak resolve though. Once you have decided that you want to accomplish something be at it and give it your best shot; but also be commonsensical enough to know when to change path. Start where you are right now. With an understanding that past is past and cannot be changed. Make the best use of your time today and make your mark – on situations, work and relationships – with your tenacity, understanding or ability to take people along. So that your today becomes one such event in a sequence of events that will set a domino effect in place in your life and create for you a future filled with glory, joy and success; or whatever you want it to be. Do you recall some events in past that have shaped your present? Do what? Inspire! Inspire! Inspire! Shared this earlier in the posts linked below and also in many other posts as relevant. Since childhood days, I have looked for opportunities to lead, to build upon ideas and to inspire. This desire led me (with 2 friends) to launch a small club of our own when the club run by our elder brothers did not let us do things our own way. On such opportunity came up – when as a teen, I organized a small session for wanna be entrepreneurs. A small group had gathered and we were all waiting for speakers to arrive. They did not turn up as planned because of some unforeseen circumstance. The situation demanded courage and a sense of responsibility. Similar opportunities came up as I move on with life and I kept grabbing them, now to a point where I plan it and look out for right opportunities. My moderate success on this path has come due to grace of the power above, some initiative and also knowing the right people through a sequence of events. I did what was the right thing to do. I spoke (shared as I like to call it) that evening amidst an encouraging audience – with the experience of having seen the speakers speak to a similar audience and a good dose of faith – that it will all go well. If I recall right – I experienced butterflies in the stomach; but eventually it was the successful debut of a professional speaking career which I hope is moving in the right direction. Same is true of my writing forays. It started with unfinished drafts, books that i did not read completely; but after some time it started to make sense – to me at least – and I believe also to my readers. For me the sequence of events here will be – a casual visit to our family doctor – Dr. Sharma who suggested me to read “Alice In Wonderland” by Lewis Carroll. He did not stop there and ignited genuine interest in me for books by sharing more about Lewis Carrol who was actually a mathematician whose real name was Charles Lutwidge Dodgson. That very day my father took me to book store and got me the book. I did not finish reading it for a long time though. I believe this is what set things in motion. You always so easily…..put me into trouble! I agree for my own good only. Ever since you said….your turn now….I have been wondering – how to do this? Previous post Is fear holding you back?